The special enrollment period is for people who are uninsured now, have not had coverage at all in 2015, paid a tax penalty for not having coverage last year, and didn’t find out about that penalty until they did their taxes. When will the coverage start? People who sign up by April 15 will receive coverage starting May 1. Those who sign up from April 16 through April 30 will receive coverage beginning June 1. Including Connecticut, 45 states (+DC) are cutting off the #ACATaxTime SEP on 4/30. Washington State is cutting things off on 4/17, while Vermont is bumping it out all the way through May 31st. 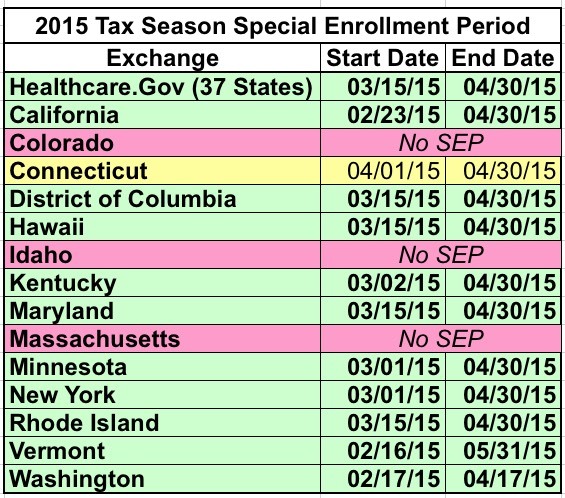 The remaining 3 states (Colorado, Idaho and Massachusetts) aren't offering any special tax season enrollment period at all, although they (like every other state) are still open for qualifying life event enrollments (getting married/divorced, giving birth, moving to a new state, losing other coverage, etc).